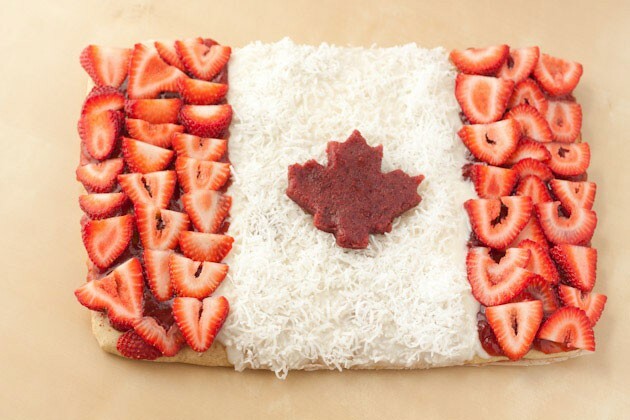 Impress your barbecue guests this long weekend with this delicious, natural, sugar-free, and gluten-free, dessert pizza. Best of all, you can have the leftovers for breakfast! Preheat the oven to 400F and line a baking sheet with parchment paper or a silicon baking mat. Set aside. In a large mixing bowl, whisk together tapioca flour, sorghum, brown rice flour, millet flour, coconut sugar, ground flax seed, baking powder, and salt. Set aside. Dissolve the 1/2 teaspoon of coconut sugar in the water before adding the dry yeast and set aside for 5 minutes. Add the yeast to the dry ingredients, then mix in oil, egg and vinegar. Beat the dough until smooth and sticky. The pizza dough should be creamy smooth and not too thick- it’s not sturdy like typical bread dough. It almost borders on batter, but can still be formed somewhat. Scoop dough onto prepare pan. Using clean hands press down lightly and flatten the dough to create a thin, even rectangle. Take your time to smooth out the dough. Set the pizza shell in a warm spot to rest and rise for 15 minutes. Brush with olive oil, cinnamon, and sugar before placing in the prepared oven for 10-12 minutes, or until golden. 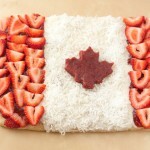 Beginning with your maple leaf, place all ingredients in a food processor and process until smooth. Drop mixture onto a sheet of parchment. Place another sheet of parchment over top, and roll the mixture until it’s about 1/2? thick. You should now have a perfect flat surface to cut into with a cookie cutter! The cookie cutter may get stuck on the mix, if so, roll back out, place in the freezer for 10 minutes, and retry. I had to be very patient removing the maple leaf from the cookie cutter, but it did work! Set aside. Begin brushing jam on either side of the pizza with a spoon until fully coated. Place sliced strawberries on top. Slowly pour melted coconut butter in the middle of the pizza until the middle portion is covered. Sprinkle with coconut, being sure not to get any on the red portion. Top with your maple leaf and you’re ready to party!